I need some good headphones or earbuds. Years ago Sony made a really, REALLY good set that I just loved. This was before Bluetooth really worked well so they were corded, but that was fine. They had the BEST little hooks to go over my ears, they wouldn’t fall out or jiggle loose if I was running or exercising, they were comfortable, and they had great sound. I still have a pair, but they don’t work with my current iPhone since Apple in their utterly finite wisdom decided to get rid of the headphone jack on the iPhone 8. Since I upgraded to the iPhone 8 a couple years ago it’s been one thing after the other, none of which is particularly satisfying. The corded funky-shaped fancy ones that come with the iPhone give the best sound – but they don’t stay in very well. I’ve got people at the office who sing the praises of the Apple Bluetooth ear buds, which are basically the same as the corded funky-shaped fancy ones but without the cord. They don’t stay in very well and then when they fall out they’re lost (and expensive to replace) because they’re not on a cord. Bounce, bounce, bounce, away they go, into traffic, into the gutter, into the bushes, into oblivion. I researched ear buds for runners, corded and cordless, and got a pair of the best reviewed set. The best thing about them is that they’re at least are connected together by a cord that hangs on the back of your neck. I’m not sure who reviewed them and said they were the best, but I have some strong disagreements on their assessment. They’re fine (mostly) if I’m sitting at my desk, but even walking around the house has them falling out. So, falling out’s a problem! #1 on the hit parade when it comes to being useless. Screw that design! I went on Amazon a couple of weeks ago and found a couple of different “cheap” (i.e., less than $30) corded “over the ear” ear bud sets. They stay on better than the ones without the “over the ear” plastic bits, but they’re nowhere near as good as the old, beloved Sonys. And while they stay on my ears, they’re not very good at staying IN my ears. They’re constantly creeping loose and wiggling out, so that while I can still hear the music, it’s tinny and a lot of outside sound gets in. They’re better, but only because the bar wasn’t very stinking high. Looking online it seems that possibly the best bet is to go to a full set of headphones rather than ear buds. I was sticking with ear buds because I want to run and exercise with them and I’m assuming that it’s awkward to do that with a full set of Beats (or whatever) on and that they would be heavy. But maybe that’s an assumption to be tested. Of course, if I get a nice pair of wireless Beats (or whatever) and the sound is great and they’re lightweight for running and all of those wonderful things, then they probably cost $300 or more. And they may or may not be waterproof or water resistant, which is an issue since I tend to sweat when running long distances and sometimes do it in inclement weather. Which, to be clear, at this point, I would pay if I could just solve the damn problem. I just don’t want to spend it and then find out that I simply have yet another set that are so-so at best and tend not to get used because they piss me off. Any suggestions? Does anyone have anything that they’ve found wonderful for running and exercising that gives good sound but also is light and comfortable? 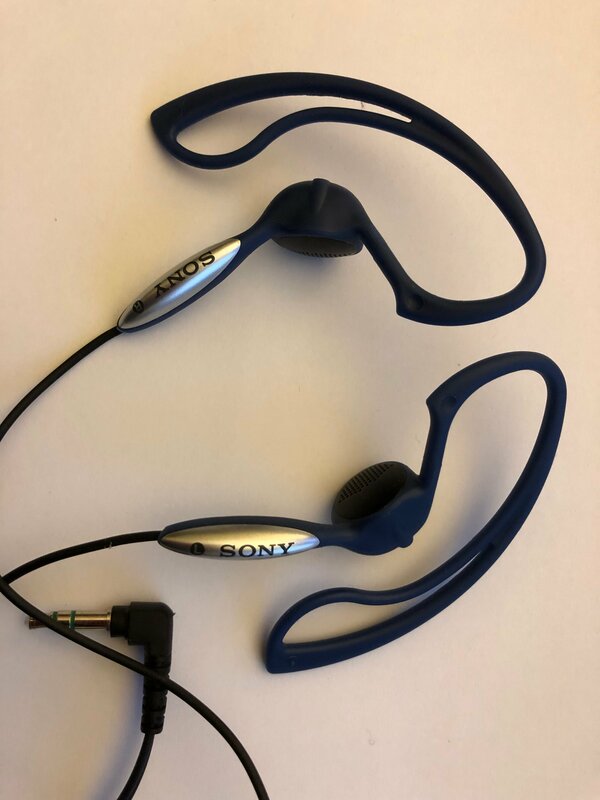 Alternately, if anyone sees that photo and says, “Oh, those are Sony XYZ87’s – I’ve got a whole box of them here we’re trying to get rid of, do you want four dozen pairs or five,” please let me know. I’ll worship at your feet. As soon as I figure out how to plug the things into my iPhone 8. Or downgrade back to an iPhone 6.